Business is the activity of making one’s living or making money by producing or buying and selling products (goods and services). Business is extremely important to a Community’s economy and wellbeing because businesses provide both goods and services and jobs. Whaingaroa Raglan has an array of local businesses that help to create a thriving community. From retail shops and cafes in the CBD, trade services, health and wellbeing, home-based business ventures, tourism operators and more. Local businesses tend to align themselves with positive values that focus on sustainability and maintaining a healthy environment. Successful businesses operating in the Raglan community provide employment opportunities and positive economic growth. Citizens of the Whaingaroa community are happy to support local business and regularly patronize the services provided. On any given day visitors and local Raglanites will experience the unified atmosphere that exists in the shops and on the streets. Raglan has a resident population of around 3,100 (2016). An estimated 500 ‘holiday homes’ (accounting for close to 30% of total dwellings in the town), provides capacity for an additional 1,500 to 2,000 persons, implying the overnight ‘day to day’ population could be closer to 5,100 at regular periods of the year. Higher peak populations occur during seasonal periods such as Christmas/New Year and Easter when larger groups of friends and family, and visitors occupy holiday homes. Over the 2016/17 November to April period, the total number of ‘unique’ visitors to Raglan was estimated by Qrious Ltd. (June 2017) to be an average 145,000 per month or 36,000 per week – refer Table 1. Domestic visitors (from outside of the Waikato Region) account for a similar share of Local visitors (Waikato Region) while Internationals account for 20%. Please note: this Snapshot report is a starting point for community-wide input and is not a finished or complete report. Your input will build on this report. We need more input from major landowners in the CBD. 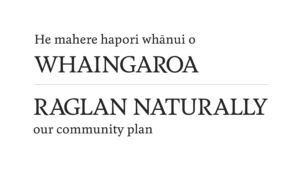 The Raglan Chamber of Commerce – The Chamber supports, fosters and advocates for vibrant and sustainable business in Whaingaroa Raglan. They encourage their members and the wider business community to uphold our community values. Wi Neera Street needs a comprehensive plan in place to allow for parks etc. Hard to get local people + youth into jobs. Is there a long term plan around the Palm trees in the main street what happens when they become old and need replacing? A stronger local element should be involved in the I site. The I site needs to be brought under the stewardship of the local Raglan Community. How does this challenge impact on Business? How does Business impact this challenge? What is the opportunity for us in Business and Employment in relation to this challenge? Aspirations & Goals Identified by the Focus Groups with supporting projects, strategies and initiatives. – Work with schools to help share knowledge about careers in community. – Satisfying the local needs locally by for example establishing a big supermarket in the CBD. There is a need there, the countdown truck coming to Raglan 3 times a day. – Long term thinking – Continue to encourage businesses to keep on contributing time and resources to the community – for development & growth of community. – Care for the land and people with long term vision. – Businesses who choose to brand themselves using the name ‘Raglan’ need to uphold the kaupapa while operating within the community and when promoting their product outside of the community. Taking into consideration the values of Raglan Naturally, the people and the land. What’s missing in our Snapshot? To work here? Or happy to go to the city/other? What employment opportunities do people want to see in Raglan?